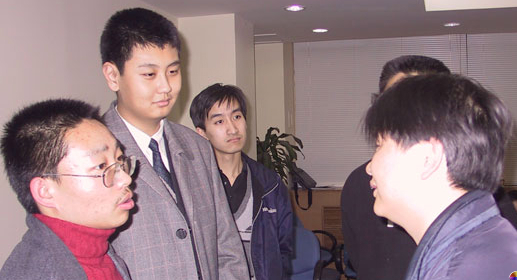 The first-ever meeting of BeiMac, the Beijing Macintosh User Group, took place on 2 March 2002 took place at Fangzheng Tower in Chengfu Road, Zhongguancun, Beijing, China. Present were David, former Founding President and now Interim Leader, as well as others, including the non-executive first members, well-known in the Chinese Mac community. A close friend and fifth member also participated in the meeting, although – sad to say – he left early, since he had something else that afternoon/evening. The entire MUG actually began with this meeting, when it was declared that the MUG has been officially created. The meeting took alongside a similar one conducted by MacFans Beijing, another Beijing MUG. That meeting went successful as well, although the synchronised meeting meant some shuffling back-and-forth for some BeiMac members. Still, the Beijing MacFans meeting (not to be confused with BeiMac; these are two separate MUGs coexisting in peace and harmony) was truly a mobile mogul’s dream come true. Suddenly, we met people who used all kinds of laptops – Apple laptops. We had an old PowerBook G3, tonnes upon tonnes of PowerBook G4s (apparantly the Titanium PowerBook G4’s appeal seeped all the way into China), and some iBooks. Our BeiMac group added two more to the list: the 14″ iBook, and the old iBook SE (grey clamshell). The six BeiMac members (including David Feng) soon settled in an informal manner (very much the way the two Steves – “Steve and the other Steve” – started everyone’s favourite fruit company all the way back in 1976) and decided to establish an executive department only when nearing Apple-recognition. David Feng has been designated a “go-to” guy for all club affairs, a title more formally known as the Interim Leader or Representative. Originally, an election for an executive department was planned. During the meeting, most computers received live help of all shapes and all sizes – including a technical UNIX manoeuvre. (Technical it was, but effective it was too!). For the rest of the meeting, most members readied for an early break, breaking out games over the network, and devouring some other ‘goodies’ and updates. This is blog content posted by David Feng, first published before 29 December 2005, before he started blogging on his own domain. All spelling, grammar, and punctuation remain the exact same way they were when the post was first published. The original post itself does not contain this text in italics.